I recently finished the recording of the Gyokko ryû Kosshi jutsu and to prepare myself correctly I went through all the notes I took over the past years, the dvds by sensei, my own seminars and the articles I committed for the internet. The Kosshijutsu of Gyokko ryû (and other ryûha) have been studied in the Bujinkan since my first visit to Noda in 1990. Over the past twenty years we have been studying the Gyokko ryû densho quite a lot but never did we have the chance to go through a full system in one time. 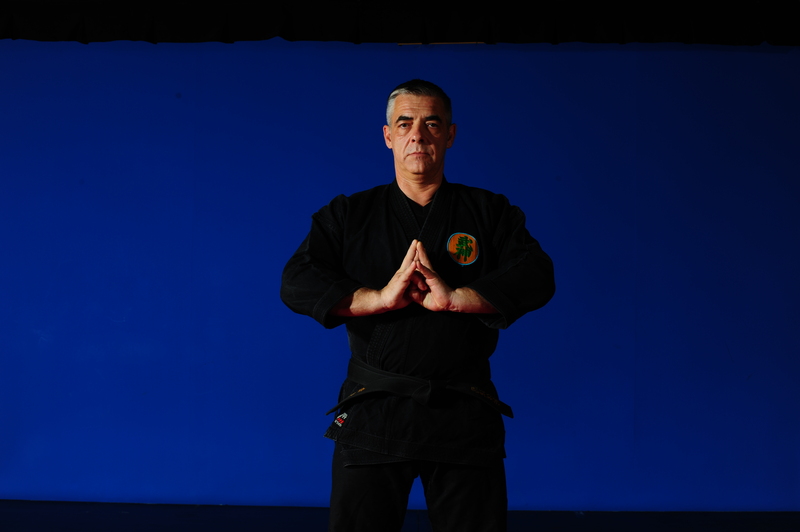 In 2001 during the « school cycle » (1998-2002) we discovered the richness of this fighting system considered by Takamatsu sensei as the root of budô. Hatsumi Sensei in his « unarmed fighting techniques of the samurai » states that: « it is taught that Gyokko ryû Kosshi jutsu is the foundation of Japanese budô » (kodansha, chapter 3, page 46). Having studied the taijutsu we applied our knowledge of Kosshi jutsu on the bô in 2005 when we entered the year of kasumi no hô (the fog principle) and studied the kasumi no bô (the bô moves like the fog). Even though those bô techniques were coming from the Kukishin ryû, we applied the feeling and principles of the Gyokko ryû Kosshi jutsu. As always, all previous learning is added to the already known and the understanding of 2010 is far from what we learnt back in 2001. But the key is to see how sensei changed our general understanding of those techniques back in 2001. And I have decided to publish again the following article written in 2001 right after I came back from a trip to Japan in April. I have added comments to the original text, they are preceded by « 2010 ». The original text always begins with « 2001 ». 2001: With the new century Hatsumi Sensei entered in a new era in the Bujinkan System. The theme for this year is Kosshi jutsu, mainly studied through the techniques of the Gyokko Ryû. From the notes I received from friends in Noda and from my personal experience last April, I will try to expose here what is, for me, the new approach taught by Sensei. As usual this text will give my point of view but not any official explanation by Sensei. If you do not agree, maybe it is because I am wrong. First, we have to understand that the techniques in the Gyokko ryû are only excuses to demonstrate the spirit and reality of the Kosshi jutsu. In this respect, it is not different from our study of Koppô jutsu of 2000, where the techniques of the Koto ryû where only an excuse to express the knack of Koppô jutsu. 2010: Even though we have studied the techniques of the Gyokko ryû, the principles explained are also available for the other ryûha. 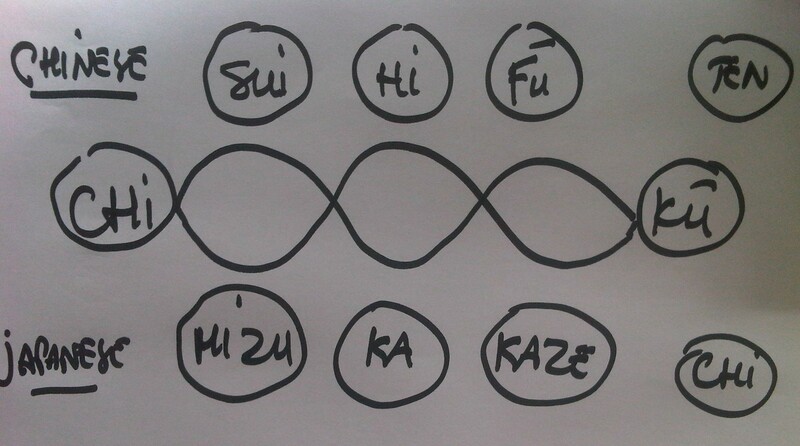 In 2003 sensei explained that the study of the « school cycle » was not to learn the techniques of the schools but only to understand the five pilars of Budô taijutsu: taihen jutsu, daken taijutsu, koppô jutsu, kosshi jutsu, & jû taijutsu. 2001: Second, we have to understand fully the reasons that motivated sensei to develop this new approach. Obviously all teachers had already the techniques written on paper as we have been studying the techniques of the Gyokko ryû extensively over the years (sic.). But what are the main differences? Kamae are different, physical attitudes are different, inner feelings are different, kamae are different in both their physical and mental expressions. Sensei referred to some of these new kamae in his writings (cf. « wisdom of life » by Joe Maurantonio) but he did not give any explanation to them. and the most important one Tenchi Inyo no kamae. 2010: In fact, one must no forget that a kamae is a still picture of a moment. Those “3 +1” kamae listed above are in fact hira no kamae (ten ryaku uchu gassho, fûten goshin gassho, hanno banitsu) moving through tenchi inyo in one of the 3 basic kamae (ichimonji, hichô, jûmonji). 2001: In my understanding (of Japanese) ten ryaku uchu gassho can be translated as “prayer for divine transmission coming from space”. Chi ryaku fûten goshin gassho means “defense prayer from the either the vault of Heaven or the whole world”. Tenchi inyo no kamae means “attitude of the link between Heaven and Earth and Yin and Yang“. Hanno banitsu is the jin moving forward to stop the opponent. Please note that until 2001, all our movements were always going backwards. We started to move forward with the Gyokko ryû! 2001: Physical movements are different in respect to these kamae. The Gyokko ryû is now divided into Ten, Chi, Jin (instead of Jo Ryaku, Chû Ryaku and Ge Ryaku no Maki previously). Ten Ryaku is expressed through Uchu Gassho; Chi Ryaku is expressed through Fûten Goshin Gassho no kamae and Jin Ryaku is expressed through Chi, Sui Ka Henka Ryaku no kamae*. Each one of these kamae with their physical expressions lead to a new inner feeling. These kamae are “waiting stances” i.e. when you wait for the opponent to attack. 2010: Today we know that each one of the 3 hira (ten uchu gassho, fûten goshin gassho and hanno banitsu) are to be executed in relation to the 3 levels of ten, chi, jin. In his book « unarmed fighting techniques of the samurai », sensei uses both terminologies and call the 3 levels jo, chû, ge or ten, chi, jin. It seems that both are correct. 2001: The last kamae, tenchi Inyo no kamae is manifested when moving from the waiting stances, you assume tenchi inyo no kamae when moving in the attack, there you link the first stances (uchu gassho, fûten goshin, chi sui ka henka ryaku*) to the movement. Even if you do not show it (kokoro gamae instead of tai gamae). Inner feelings also change, each attitude develop a feeling perceived by Uke that will lead him into his own destruction, uchu gassho gives unity (body and mind) to Tori. Fûten goshin gives power in the movements. Chi sui ka henka ryaku* frightens Uke. Let us now go beyond our regular senses. If you were able to see the energies from the body, you would notice that each of these kamae acts as a physical “mudra”. Uchu gassho builds a beam of white energy coming from Heaven and surrounding your whole body (like the teletransportation stuff in Star Trek). With fûten goshin gassho, Tori disappears from Uke‘s perceptions, Uke can only senses a very thin beam of light coming from the ground, Earth (it is like water coming from a tap). Tori when assuming this kamae moves like the wind. Chi sui ka henka ryaku no kamae* sends a feeling of fear to Uke. Uke‘s mind (and actions) is trapped by the stance. It is like a funnel of energy coming from Tori‘s body. You can think that I am exaggerating but this is the truth. Now these movements would be meaningless if there was nothing more. And there is a lot more. Everything you do from now on should imply a new understanding: “Banpen fûgyo“. Literally it means “10000 changes, no surprise”. This is the key to the understanding of Kosshi jutsu. Keeping this principle in mind will allow you to finally get to the “Shizen gyô un ryû sui” or “ever adapted movement” (this is what we often call the “natural movement”). The Japanese are more concerned about the physical Nature where the Chinese are more concerned about divine Nature. For example, “Sui” is the water coming from the sky (Heaven, Ten) where “Mizu” is the water you find on the ground (Earth, Chi). “Hi” is the fire from the sun (Heaven, Ten) where “Ka” is the bonfire on the ground (Earth, Chi); “Fû” is the wind from the sky (Heaven, Ten) where “Kaze” is the wind on the ground level (Earth, Chi). This “physical” understanding of life gives the Japanese a definitely different system of concepts. 2010: In my July 2001 trip sensei explained more about the gravity concept. In fact the Gyokko ryû deals with three concepts that are three different understanding of the same object. Those 3 concepts explain three different aspects of reality. When teaching the Gyokko ryû sensei stressed the importance of fûsui (風水, feng shui); i.e. wind and water. All movements must express the flow of the wind (ten) and the water (chi) in order to counter jin. *this kamae was then called Hanno banitsu no kamae (cf. « Unarmed fighting techniques of the samurai » page 46. I have a written note from 2001 by sensei where he wrote it differently « hanno bon itsu ». Thank you for sharing. I really enjoyed to read how the years of training gave you a new angle to see the Kamaes in deeper meanings. When referring to first/second editions, do you mean those of « unarmed fighting techniques of the samurai » ? Is there a second edition of that book? The book was out of print rapidly so they republished it with a few changes. But it is not a “new version”.